Toast the spices. Though I don't think this makes a huge difference because the broth cooks for so long, some cooks toast the spices before adding them to the broth. For this approach, use a skillet set over a medium-low flame. Once the star anise, cloves and cinnamon are fragrant, remove them from the heat. Lightly crush the spices using the flat side of a knife or mortar and pestle. Encase them in cheesecloth or a mesh spice/herb ball and add to the broth. Vary the spices. Some Viet cooks omit the cloves, reduce the amount of star anise and instead, use thao qua (black/false cardamom). Available at Asian markets, the dried brown pod (pictured above on the right) resembles a ridged whole nutmeg. Thao qua has a strong smoky, camphor aroma. In the recipe provided here, use 1 star anise and 1 thao qua; keep the cinnamon but omit the cloves. Use the flat side of a knife to gently whack the pod, breaking open its skin to expose the pyramid shaped seeds. Place in cheesecloth or a spice/herb ball and add it to the broth. Once you can smell its fragrance, remove the thao qua from the pot. Otherwise, it will over power the other elements. Make broth with oxtail. Some Viet cooks swear that using oxtail instead of beef leg bones yields a superior broth. Oxtail is rather pricey so I'm not sure if the bit of extra flavor and gelatinous texture is worth the expense. If you'd like, use all oxtail or substitute some of the leg bones with an oxtail. Add daikon. Omit the sugar and add daikon to sweeten the broth. Peel ¾ to 1 pound of daikon and cut into 4-inch sections. Add it to the broth along with the onion, ginger and other ingredients. Garnish with poached scallion. What to do with the leftover white parts of the scallion? Drop them in the broth for hanh tran (poached onion), a homey pho garnish that people will fight for. Embellish with other beefy elements. 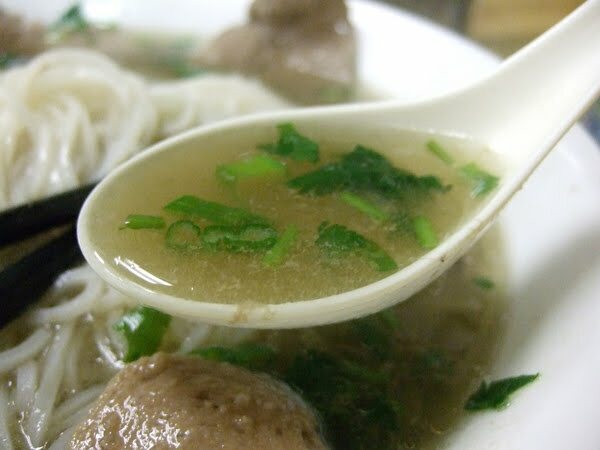 If you want to replicate the splendorous options available at pho shops, head to the butcher counter at a Viet or Chinese market. There you'll find white cords of gan (beef shin tendon) and thin pieces of nam (outside flank, not to be confused with flank steak). While the tendon requires no prepping prior to cooking, the nam should be rolled and tied with string for easy handling; slice the nam with the grain for assembly. Simmer these ingredients (as you would for any cooked meat) in the broth for two hours, or until chewy-tender.